Having read Predictably Irrational by Ariely, and being fascinated by just how much we are so bad at being "rational," I was excited to read this book, about being irrational with money. I was excited mostly because I expected that Ariely and Kreisler would both show how everyone is weird with money, and suggest ways to counteract our weirdness. 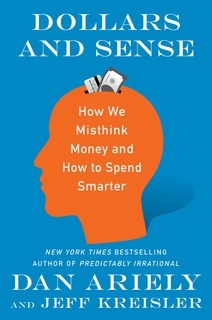 This book is a fantastic explanation of human quirks around money, and a quick summary of ways to combat our quirks. I recommend this book. For maximum effectiveness, when reading, don't skip to the end. We decide how much to eat not simply as a function of how much food we actually consume, but by a comparison to its alternatives. Another place we see this kind of comparison is with quantity (so-called bulk) discounts. It seems that discounts are a potion for stupidity. They simply dumb down our decision-making process. When an item is “on sale,” we act more quickly and with even less thought than if the product costs the same but is marked at a regular price. Happiness too often seems to be less a reflection of our actual happiness and more a reflection of the ways in which we compare ourselves to others. In most cases, that comparison is neither healthy nor good. In some ways, the concept of regret is itself just another version of comparison. With regret, we compare ourselves—our lives, our careers, our wealth, our status—not to other people, but to alternative versions of ourselves. A curious finding about the way we categorize money is that people who feel guilty about how they got money will often donate part of it to charity. 2 Let that sink in: How we spend money depends upon how we feel about the money. We’re easily led astray by emotions, selfishness, impulse, lack of planning, short-term thinking, self-deception, outside pressure, self-justification, confusion, and greed. We might consider those the Ten Financial Sins. Not Deadly Sins, but certainly not good. We could “virtually” end the trip before we get into the unpleasant stuff by, for instance, celebrating the end of the trip the night before we check out. Another solution would be to prolong the trip. After we get home and deal with reentry into everyday routine, we can make time to talk over memories and experiences, look at the pictures, and write some notes, all while the journey is fresh in our minds. Spending time savoring the vacation brings the experience into our regular lives and this, too, can give us a softer ending. The pain of paying is, as it sounds, the idea that we experience some version of mental pain when we pay for things. The term “the pain of paying” was based on the feeling of displeasure and distress caused by spending, but more recently, studies using neuroimaging and MRIs have showed that paying indeed stimulates the same brain regions that are involved in processing physical pain. When we experience any pain, our first instinct is to try to get rid of it. We want to ease our pain, to control it. When we see pain coming, we flinch, we duck, we avoid it. Avoiding pain is a powerful motivator and a sly enemy: It causes us to take our eyes off value. We make faulty decisions because we’re focused on the pain we experience in the process of buying, rather than the value of the purchase itself. The point is, we can increase or decrease the pain of paying that we feel at any time, for any transaction. But we should do so deliberately, based upon how much we want to enjoy or limit our spending, rather than just letting it increase or decrease without our knowledge or control. When we fill up our car with gas, we watch the dollars spin by on the gas pump. Aware of our spending, we feel the pain of paying and perhaps contemplate buying a more efficient vehicle or finding a carpool group. But at home, the energy meter is usually outside or hidden. We rarely look at it. Moreover, the bill for the usage in any one day or week doesn’t come for a month or more. And then it is often deducted directly from our checking account. Thus it’s impossible to tell what we’re spending at any one moment. So we are not as aware of our spending and we do not feel the associated pain. In some cases, it feels almost free right now. We’re not paying until the great, unknowable, optimistic future, when we may be a lottery winner or a movie star or inventor of the solar-powered jetpack. When we pay for a restaurant meal with a credit card, do we really feel like we’re paying right now? Not really. We’re just signing our name; the payment will be sometime in the future. Similarly, when the bill comes later, do we really feel like we’re paying? Not really. At that point, we feel like we already paid at the restaurant. Not only do credit card companies employ the illusion of time shifting to alleviate the pain of paying, but they do it twice—once by making it feel like we are going to pay later and once by making us feel like we already paid. This way they enable us to enjoy ourselves, and spend our money, more freely. Credit cards also make us value purchases differently. They seduce us into thinking about the positive aspects of a purchase, in contrast to cash, which makes us also consider the downsides of the purchase and the downside of parting with our cash. Free is a strange price, and yes, it is a price. When something is free, we tend not to apply a cost-benefit analysis to it. That is, we choose something free over something that’s not, and that may not always be the best choice. Another effect of free is that once something initially costs us nothing, it becomes very difficult to start paying for it later. A dollar clearly is not a lot in the scheme of things, particularly for something that enriches our life. Taking the pain of paying into account, the recommended method for splitting the bill with friends is credit card roulette. When the server drops off the check at the end of a meal, every one puts down their credit card. The server picks one, and that one person pays the entire bill. ANCHORING occurs when we are drawn to a conclusion by something that should not have any relevance to our decision. It is when we let irrelevant information pollute the decision-making process. We don’t ever get to doubt decisions that we make unconsciously, that we don’t pay attention to, that we’ve forgotten, or those we’ve been using thoughtlessly forever as a foundation for our lives. We stand on the shoulders of giants . . . even if those giants are the giant mistakes we ourselves have made. Investing in anything causes us to increase our sense of ownership, and ownership causes us to value things in ways that have little to do with actual value. They found that people who held a coffee mug in their hands for more than thirty seconds were willing to pay more to buy that mug than were those who held it for fewer than ten seconds or not at all. We feel the pain of losses more strongly than we do the same magnitude of pleasure. If we’re very sensitive to small fluctuations over time, one solution is to simply make a long-term decision and stick to it. Sunk costs are costs that are permanently in the loss column of our life-ledger. They are ours, we can never get rid of them, we own them. We don’t just see the dollar amount, we see all the choices and efforts and hopes and dreams that went along with those dollars. They become weightier. And since we overvalue these sunk costs, we’re less willing to give them up and we are more likely to dig ourselves deeper into a hole. One way to overcome the traps of ownership is to try to separate ourselves psychologically from the things that we own, in order to more accurately assess their value. When the sender offers less than a third of the total amount, the receiver most often rejects the offer and they both go home with nothing. People actually refuse free money in order to punish someone—someone they don’t know and probably won’t deal with ever again—just for making an unfair offer. Ultimately the problem is that we have a hard time paying for knowledge and acquired skills. It’s hard for us to account for the years spent learning and honing those skills and factor them into what we’re willing to pay. All we see is that we’re paying a lot for a task that didn’t seem too difficult. This is what expectations do. Expectations add color to the black-and-white images we hold of our future selves. Once again, past performance is simply no guarantee of future success. But go tell this to our expectations. Just because something went well in the past, that doesn’t mean it will in the future. When we pay before we consume something, it reduces the pain we feel at the time of consumption. Hopefully the rest of us are not jerks, but we are like Vinny sometimes, when we, in our failure to recognize our behavior, rely upon our expectations to evaluate our choices and determine our spending. That’s what happens when we add emotions to the decision-making mix: Now tempts us, but the future doesn’t. Much of what makes us so emotionally detached from our future selves is the fact that our future selves are so poorly defined. We often imagine our future selves to be entirely different people than our present selves. That’s because self-control requires not just a recognition and understanding of the temptations of now, but also the willpower to avoid them. And willpower, by definition, requires effort—the effort to resist temptation, to refuse our instincts, to turn down a free marshmallow or fancy bike gear or anything that has any emotional resonance. That’s because another important way we value things—a way unrelated to actual value—is by assigning meaning to a price. When we can’t evaluate something directly, as is often the case, we associate price with value. In Predictably Irrational, Dan showed that we are conditioned to see high price as a stand-in for effectiveness. While few people consider maximizing frequent-flyer miles to be the key to a life worth living, it’s tempting to maximize anything that’s easily measurable. Money works the same way. It isn’t the final goal in life, it’s a means to an end. But because money is much more tangible than happiness, well-being, and purpose, we tend to focus our decision-making on money instead of on our ultimate, more meaningful goals. doing. Well, they didn’t understand what he was doing, but they were not dismissive. They were trying to understand. They were using the money question as a proxy in an attempt to learn. Seeking monetary terms was a bridge for them to reach out, to translate the intangible, incomprehensible steps Jeff was taking into a language they could understand: money. When it comes to making financial decisions, what should matter are opportunity costs, the true benefit a purchase provides, and the real pleasure we receive from it compared to other ways we could spend our money. Language, rituals, and expectations are in a different group from the other factors because they can change the experience. Think about transactions in terms of opportunity costs by considering more explicitly what we’re sacrificing for what we’re getting. When we see a sale, we shouldn’t consider what the price used to be or how much we’re saving. Rather, we should consider what we’re actually going to spend. We should try not to think in percentages. When the data is presented to us in percentages (for example, 1 percent of assets under management), we should do the extra work and figure out how much money is really on the line. Money is fungible. Every dollar is the same. It doesn’t matter where money comes from—our job, an inheritance, a lottery ticket, a bank robbery, or our gig moonlighting as the bassist in a jazz quartet (dare to dream)—the money is all ours and it belongs, in fact, to the general “our money” account. ... remember that using mental accounting to categorize our spending can be a useful budgeting tool for those of us who can’t do constant, instantaneous opportunity cost calculations. When it comes to spending, trusting our past decisions contributes to the problems of anchoring, herding, and arbitrary coherence. So we should question seemingly “random” numbers, prominently placed MSRPs, and insanely high-priced products. ... question the prices we set ourselves. We should avoid doing something all the time, like getting a $ 4 latte, just because we’ve always done it before. From time to time, let’s stop and question our long-term habits. We should watch out for trial offers and promotions. Marketers know that once we own something, we will value it more and have a harder time giving it up. Sunk costs cannot be recovered. If an amount is spent, it’s spent. The past is past. When making decisions, consider only where we are now and where we will be in the future. Let’s also recognize that there is value in knowledge and experience. Craftspeople have perfected the art of making what they do look effortless, but it’s not. From Picasso to parenting, sometimes the most difficult jobs look easier than they really are. But let’s be careful not to fall for false effort. We ought to watch out for too much transparency. If the description of something, or the process of consuming something, is long-winded and overblown, we’re probably paying for that description and process, even if it doesn’t add any real value. remember that language and rituals can change the quality of our experiences, so we should embrace them to enhance experiences if we so choose. Expectations give us reason to believe that something will be good—or bad, or delicious, or gross—and they change our perception and experience without altering the true underlying nature of the thing itself. We should be aware of the source of expectations—whether it’s the pleasure of dreams and aspirations or the irrelevant allure of brand names, biases, and presentation. As with language and ritual, we—Dan and Jeff—want to acknowledge, again, that expectations actually can alter our experiences. We can use such expectations to our advantage or they can be used by others to take advantage of us. We don’t want to be manipulated unwillingly or unconsciously by someone else, but if we choose to be manipulated or design a system to do so ourselves, that’s okay. We overemphasize money Prices are just one of the many attributes that signal the value of things. Consider using other criteria, even when they’re hard to measure. A price is just a number, and while it can be a powerful part of a decision, it doesn’t, and shouldn’t, mean everything. When we don’t have any specific idea about an item’s value, we should do some research. Use simple tools to help us imagine our future self more vividly, specifically, and relatably. 2 It can be as simple as having an imaginary conversation with an older “us.” Or we can write a letter to an elderly version of ourselves. We can also simply think about what our specific needs, desires, greatest joys, and toughest regrets will be when we’re sixty-five, seventy, ninety-five, one hundred. We can start with self-conversations, but we should also put in place other systems that help us become emotionally invested in our older selves. The more we can make the future defined, vivid, and detailed, the more relatable it becomes, and the more we’ll care, connect, and act in our future selves’ interests, too. A Ulysses contract is any arrangement by which we create barriers against future temptation. We give ourselves no choice; we eliminate free will. Common financial Ulysses contracts include things like preset limits on our credit cards or only using prepaid debit cards or even canceling all of those cards and only using cash. Another way to combat self-control problems is through REWARD SUBSTITUTION. What if we tried to bypass our inability to be motivated by future reward altogether and replaced it with another kind of present reward? The gold coin made the act of saving salient by changing what people were thinking about as they were going about their day. We should react most strongly to the method that maximizes our money—a bonus for saving, which is free money—but we don’t. We are more influenced by something that shapes our memory, attention, and thinking, such as the coin. There are several ways to use this checking balance rule to our advantage, to use it to trick ourselves into saving. For example, we can move a little bit of money out of our checking and into a savings account. That way, our checking account will be artificially too low and it will get us to think that we’re poorer than we really are. from ourselves. Yes, if we stop to consider it, we know we’re hiding it and where. But we can take advantage of our cognitive laziness and the fact that we don’t regularly think about how much money is in our other accounts—and we think about it even less if it’s automatic deposit and we don’t move the money ourselves every time. So, tricking ourselves is an easy and useful strategy.